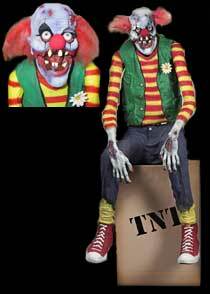 Chuckles the Clown measures 5 1/2 feet tall and includes his own TNT box. His Flapping jaw adds a touch of realism you have to see to believe! Chuckles is a hard foam prop with a 360 degree view. He shivers and shakes and almost comes to life. He is powered by a 110 volt outlet.OVER 5 1/2 FEET TALL, INCLUDES TNT BOX.Powered by 110 volt outlet.